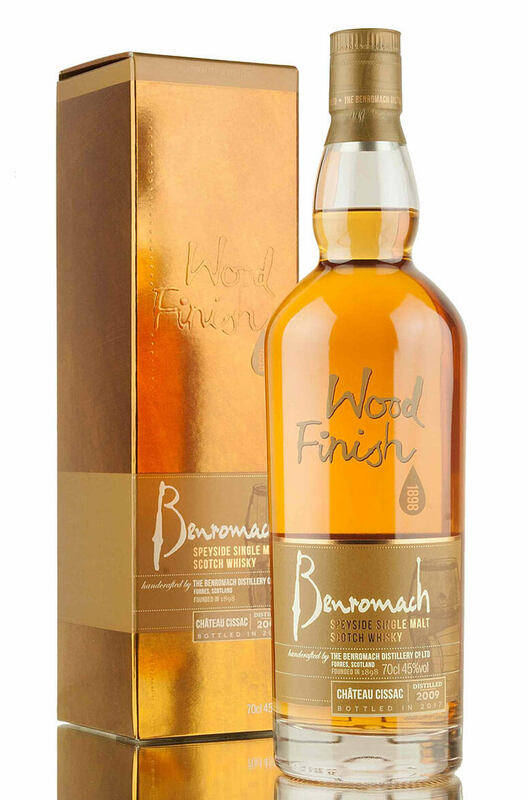 This 2017 release from Benromach was initially matured in first fill Bourbon barrels before being transferred into red wine Bordeaux casks from Ch. Cissac for another 25 months of finishing. A subtle finish gently enhances the malt and light smoke flavours of the whisky. Aromas (with water) There are hints of pressed green apple and pear... and delicate oak aromas develop, complemented by the lingering peppermint. Aromas (without water) The fabulous influence of the Château Cissac casks will be immediately apparent, with melon notes, red apples, delicate and zesty orange peel and dark chocolate. There’s also an underlying floral note and a delightful charred oak edge. Palate (with water) At first you’ll sense some spiciness and cracked black pepper. A slight bitterness develops, with grapefruit and orange peel. Now you may detect deeper hints of bonfire embers, complemented by Brazil nuts and gorgeous cocoa flavours. Palate (without water) It’s slightly peppery on the palate with sweet vanilla, creamy milk chocolate... there’s even refreshing lemon and limeade flavours with a nod and a wink towards the effervescent. Satisfying hints of red wine tannins emerge, complementing a lingering peat smoke. Types of Barrel used for Aging Initially aged in first-fill Bourbon barrels followed by a finishing period in Chateau Cissac wine barrels. Something a bit different from the Benromach Distillery on Speyside. This single malt was triple dis..